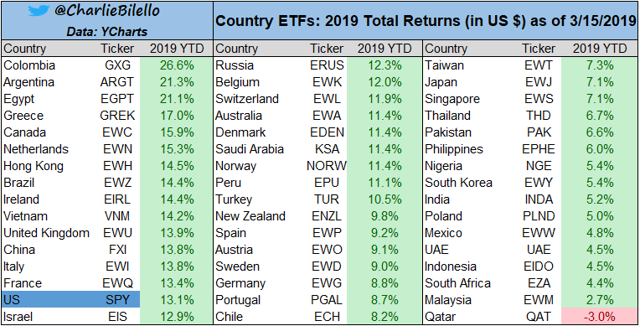 With literally everything painted in bright green, 2019 is, thus far, the best start to a year we've seen since 1987. 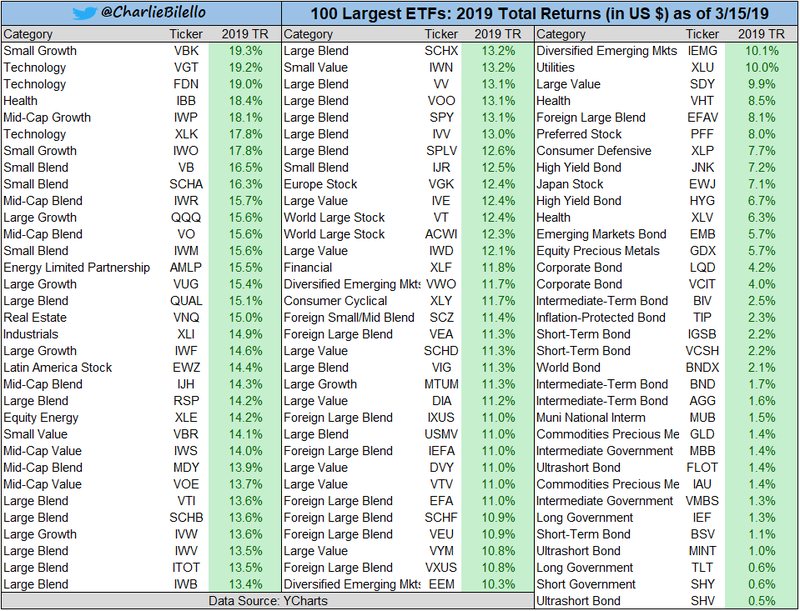 The largest 100 ETFs are all trading in positive territory, the S&P 500 is up over 13%, and the average country ETF is up about 11%. The employment situation hasn't been better in over a decade, and even the poverty trendline is a very encouraging chart to look at. 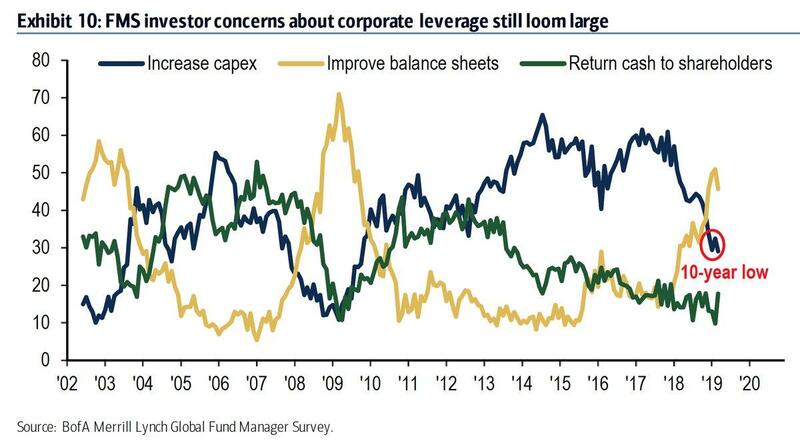 With so many positives, what are investors' main concerns? You might be surprised but there are more than a few. Perhaps the biggest risk of them all is when everything in the green and expectations are (too?) high, perhaps unreal. 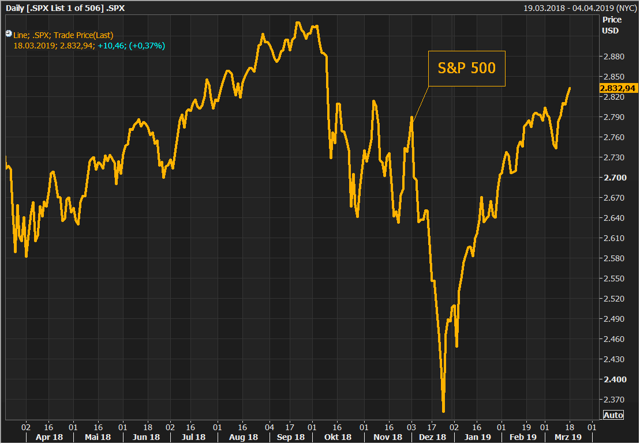 Over the past 15 months, the S&P 500 (SPY) has been mostly contained within the 2,600-2,800 range. 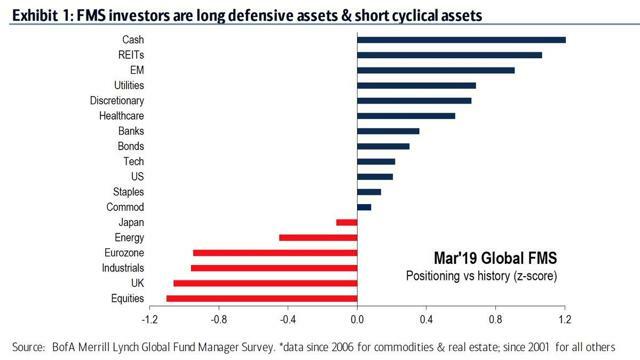 Some pundits said, before the new year started, that one thing is for sure: 2019 is going to be a difficult year for investors. 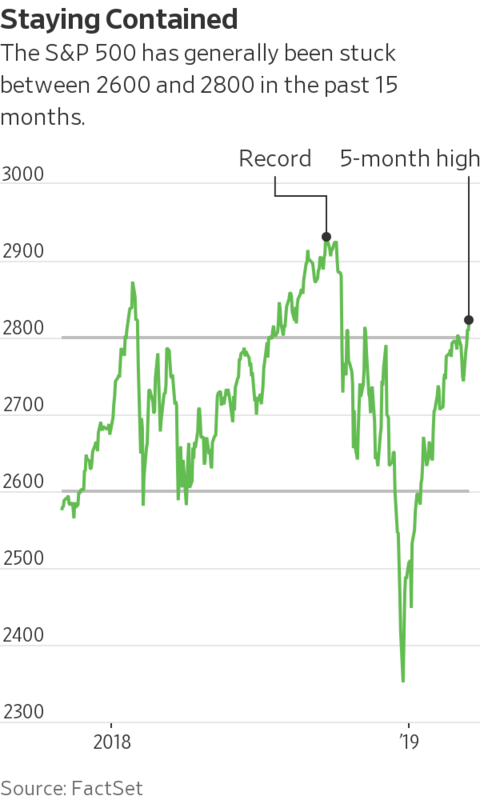 The S&P 500 is on track for its strongest first quarter since 1998. It will be hard for Fed Chairman Powell to really impress stocks at this point, given the already-elevated, i.e., very dovish, expectations out of the Fed. Consensus now anticipates no more rate hikes in 2019, with normalization ending as early as September this year, at ~$1.3T reserve balance. To exceed those expectations, the Fed's "dot plot" would need to have no dots at all, neither in 2019, nor in 2020 with reserves at ~$1.4T by September or earlier. Possible? Perhaps, but surely not probable. 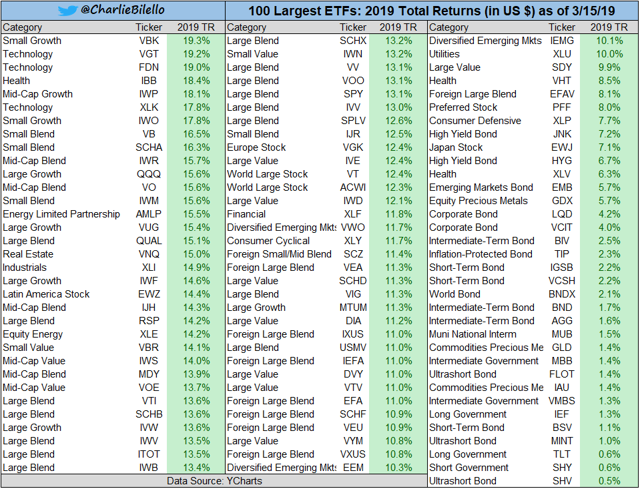 None of the 100 largest ETFs is delivering a negative total return, so far, in 2019. None! Small-cap growth/blend (VBK, IWO, VB, SCHA, IWM), Technology (VGT, FDN, XLK), and Mid-cap growth/blend (IWP, IWR, VO) are leading the way, but even long-term (TLT) and short-term (SHV, SHY) US Treasuries ETFs have managed to stay in the green thus far this year. 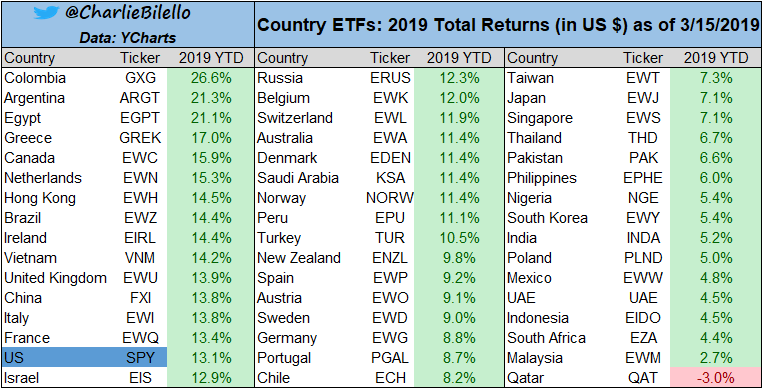 With the exception of Qatar (QAT), every country ETF is positive in 2019, with an average return of +11%. This is the best start to a year since 1987 (although we all remember what 1987 eventually brought with it, on October 19th, 1987...). 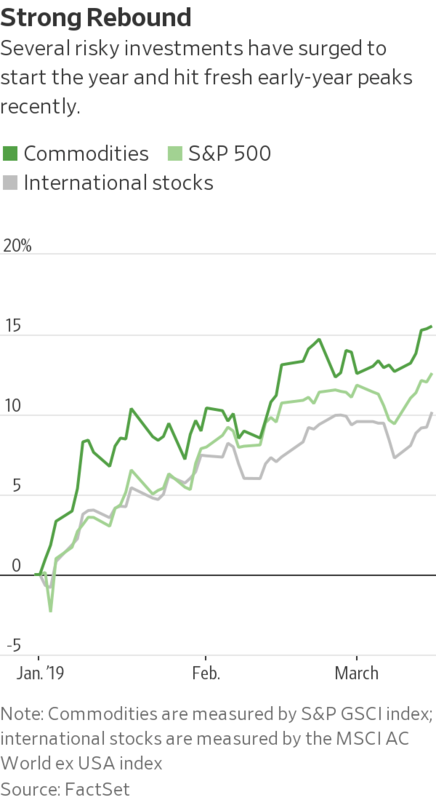 South America - Colombia (GXG), Argentina (ARGT), and Brazil (EWZ) - is leading the way, but Europe - Greece (GREK), the Netherlands (EWN), Ireland (EIRL), and the United Kingdom (EWU) - aren't too far behind. US Junk bonds/loans (HYG, BKLN) and Emerging Markets debts ("EM"; EMB, HYEM, EMLC) are leading all major fixed income ETFs so far in 2019. 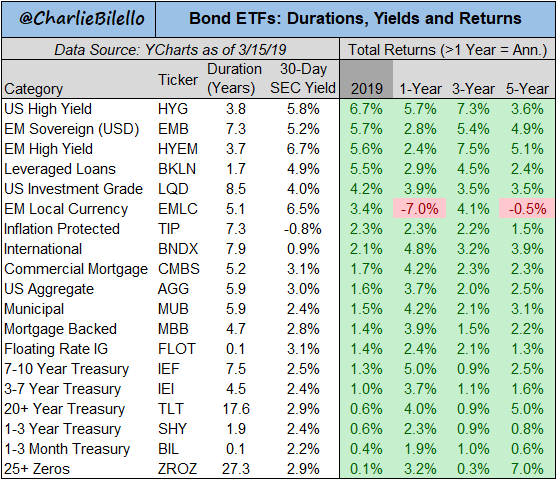 This proves that there's still a strong appetite for risk, especially compared to the underperformance of the much-safer (all types of) US Treasury debts (ZROZ, BIL, SHY, TLT, IEI, IEF). 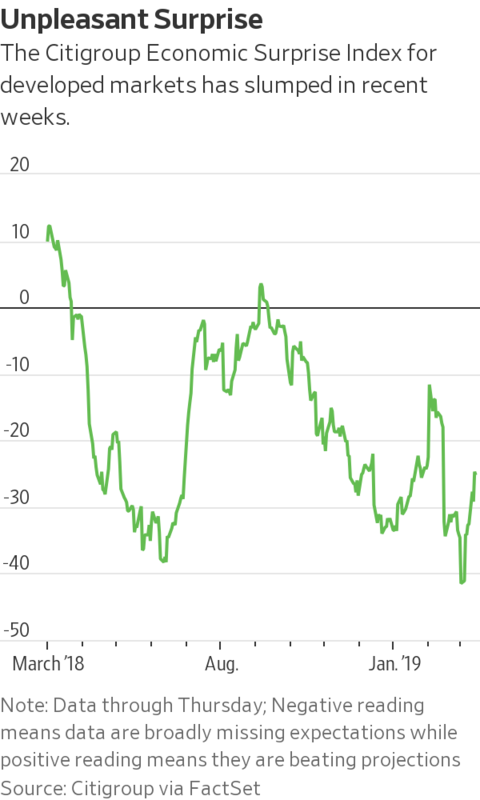 To put things in the right context, here's how much investors like EM bonds, even after the recent rally. 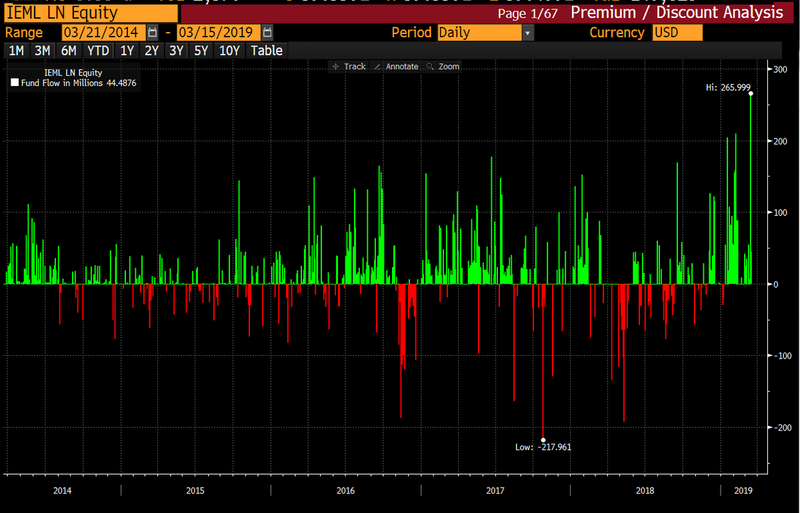 This local-currency EM bond ETF (IEML, trading in London) just saw its biggest one-day inflow in its history! In 2009, the number of unemployed people in the US exceeded the number of job openings by almost 13 million. 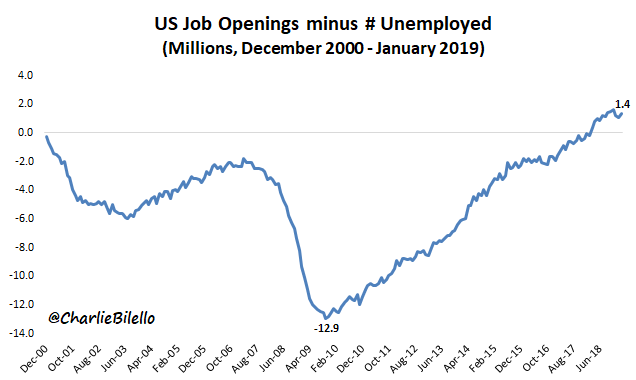 Today, the number of job openings exceeds the number of unemployed people by about 1.4 million. The unemployment rate among OECD member-countries is as beautiful as a bullish chart can be. 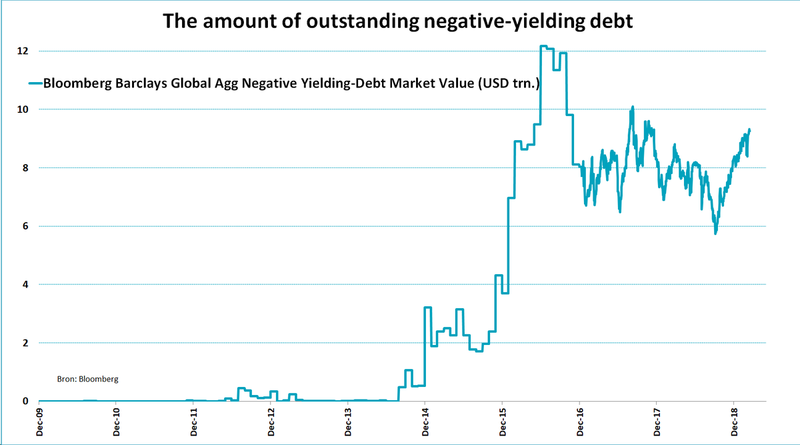 The total amount of negative yielding debt is now greater than $9.2 trillion. 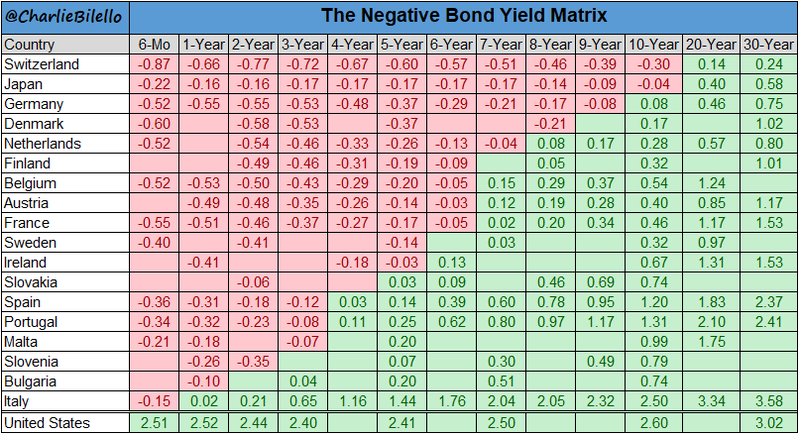 Even after we've passed the 10th anniversary since the market bottomed on March 9th 2009, there are 18 countries with negative bond yields. Ten years of global economic expansion is, apparently, not enough. 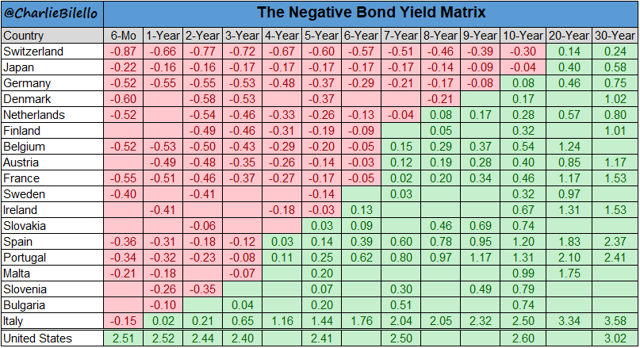 Let's not forget the partially inverted yield curve that we see for few months already. We sometimes focus so much on the negatives, and what else is still needed to get fixed, that we forget to look at the bright spots, and there are plenty of those too. 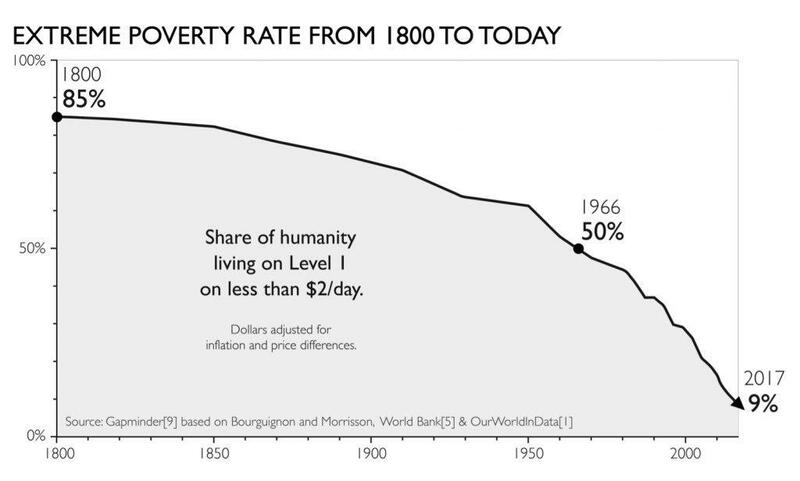 On one hand, the world has come a long way over the past 200+ years, when it comes to dealing with poverty. On the other hand, the distribution of wealth in the the US is almost as bad as it was in 1917. Circa 100 years went by and we're back to square one. If you ask yourself, just as I did, why Apple (NASDAQ:AAPL) is (was?...) struggling, the below chart might provide you with an answer. Let's combine the two - Berkshire Hathaway and technology - shall we? 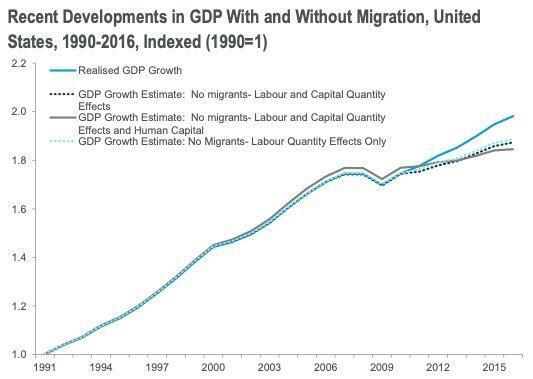 In case you wonder whether migration is a good or bad thing for US growth, the below chart - showing the impact of migration on US GDP - is providing a clear-cut verdict. 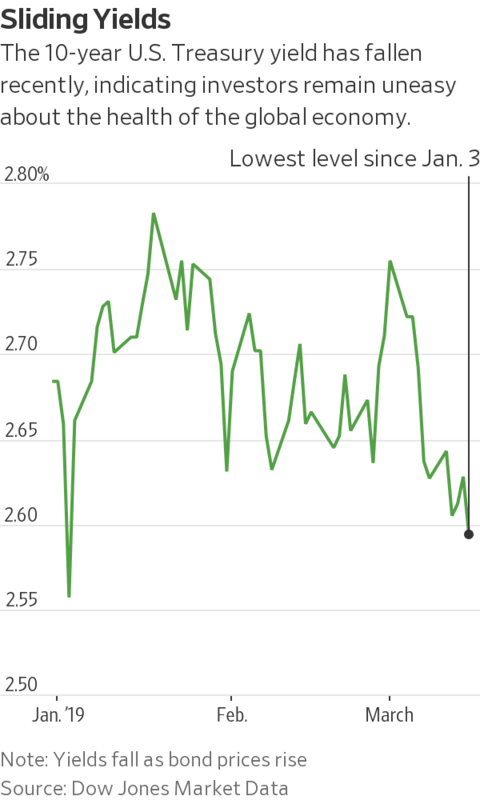 In spite of the growth rate still seeming healthy, there are signs of the economy slowing down. 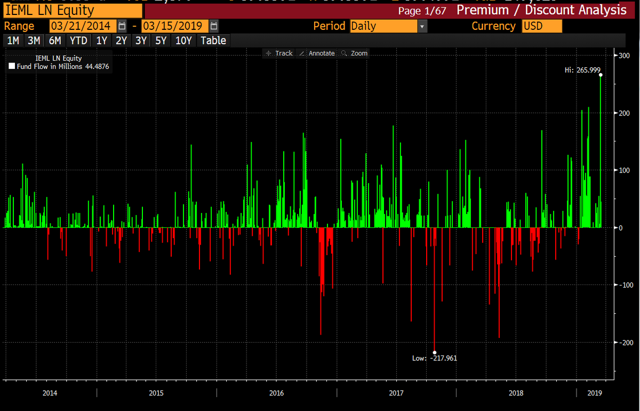 The funny thing is that the most worrisome sign of them all - the US 10-year Treasury yield (trading at very distressed levels) - has nothing to do with growth directly. “Pain trade” for stocks is still up, according to BofAML's (BAC) March Global Fund Manager Survey ("FMS"). The FMS finds that profit expectations rose, rate expectations fell, yet allocations to stocks dropped to their lowest level since September 2016.
Credit concerns remain the key macro bull barrier. 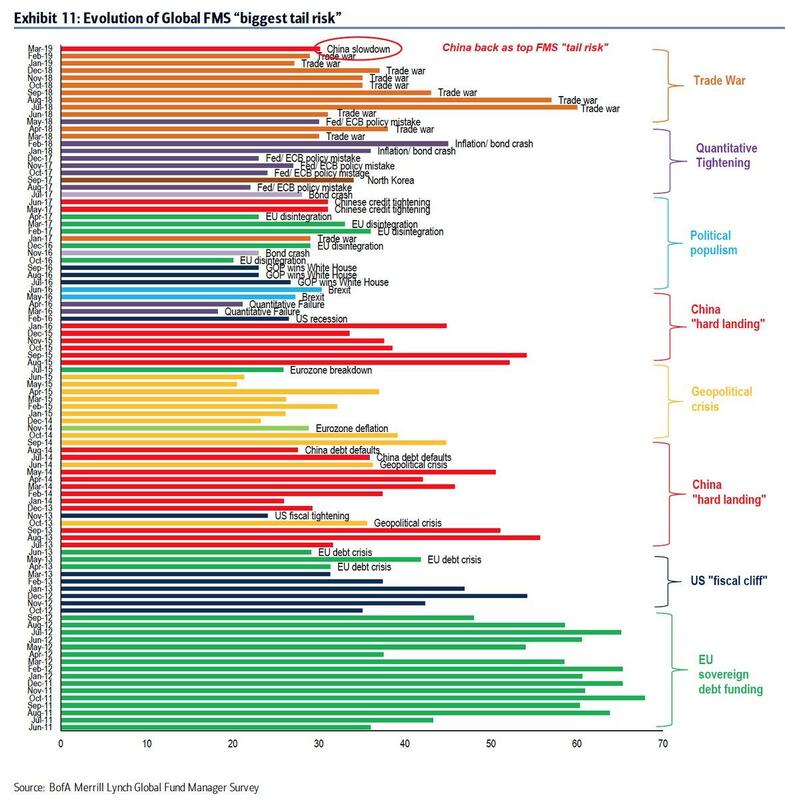 "Hard landing in China", the world's second largest economy, has replaced "Trade War" as the number 1 risk, according to the FMS. 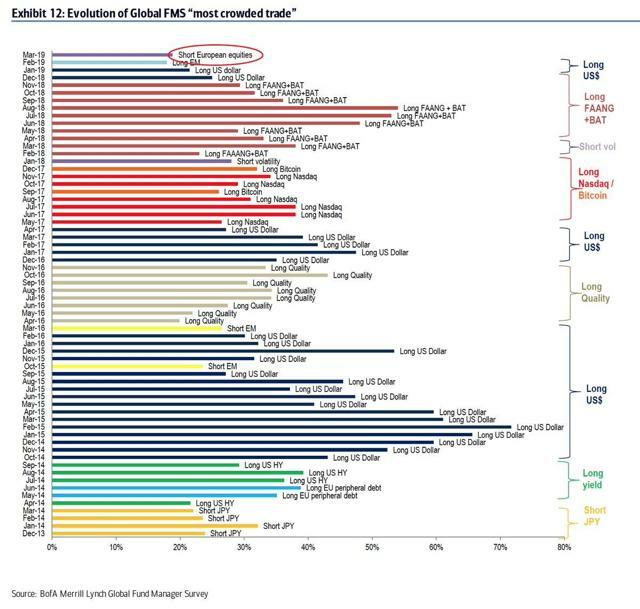 “Short European Equities” (VGK, EZU, HEDJ, FEZ, IEUR, BBEU, IEV) is now the most crowded trade, for the first time in the FMS history, replacing “Long EM” (VWO, IEMG, EEM, SCHE, SPEM, DEM, GEM) which drops to 4th place. 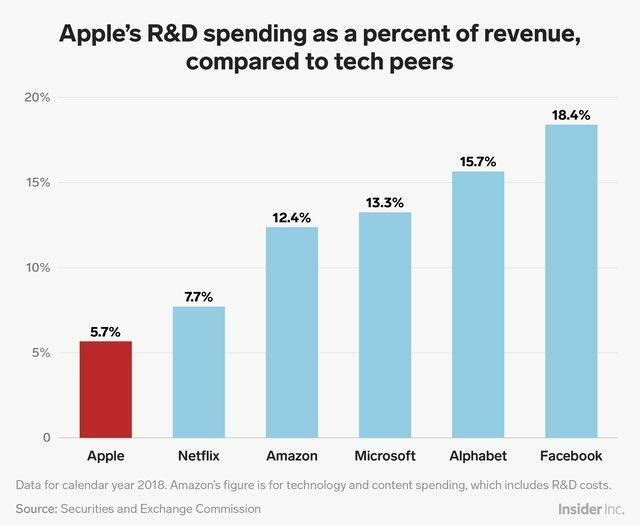 In between, "Long USD" (UUP) and "Long FAANG+BAT" - i.e., Facebook Inc. (FB), Amazon.com Inc. (AMZN), Apple Inc., Netflix Inc. (NFLX), Alphabet Inc. (GOOGL) (NASDAQ:GOOG), Baidu Inc. (BIDU), Alibaba Group Holding Ltd. (BABA), and Tencent Holdings Ltd. (OTCPK:TCEHY) - are ranked 2nd and 3rd most crowded trades, respectively. Remember: The biggest risk is sometimes the one you're neither seeing, nor anticipating; or simply ignoring. 2nd ANNIVERSARY SPECIAL SALE: 12% DISCOUNT!!! The Wheel of FORTUNE is a most comprehensive service, covering all asset-classes: common stocks, preferred shares, bonds, options, currencies, commodities, ETFs, and CEFs. Monthly Review, where all trades are monitored. Trading Alerts. We don't trade every day, but we issue one trade per trading day, on average. 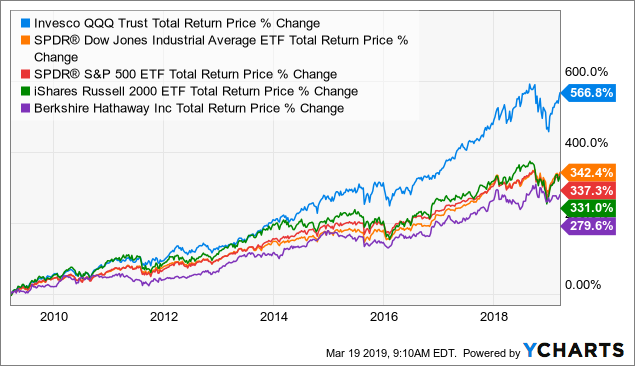 Model Portfolio, aiming at beating the S&P500 performance. “Getting Ready For 2019“, a 19-part series, featuring our top picks across eleven sectors plus eight segments. Until 3/20 Only: 12% DISCOUNT!!! Spin the Wheel, Make a Fortune!!! Disclosure: I am/we are long FB, BABA, TCEHY. I wrote this article myself, and it expresses my own opinions. I am not receiving compensation for it (other than from Seeking Alpha). I have no business relationship with any company whose stock is mentioned in this article.